Organically grown fresh mushrooms, featuring varieties of oyster mushrooms, lions mane, nemeko, wine cap, and cordyceps. Locally harvested wild mushrooms available based on the season featuring: Morels, Porcini, Lobster, Chanterelles, Black Trumpet, etc. 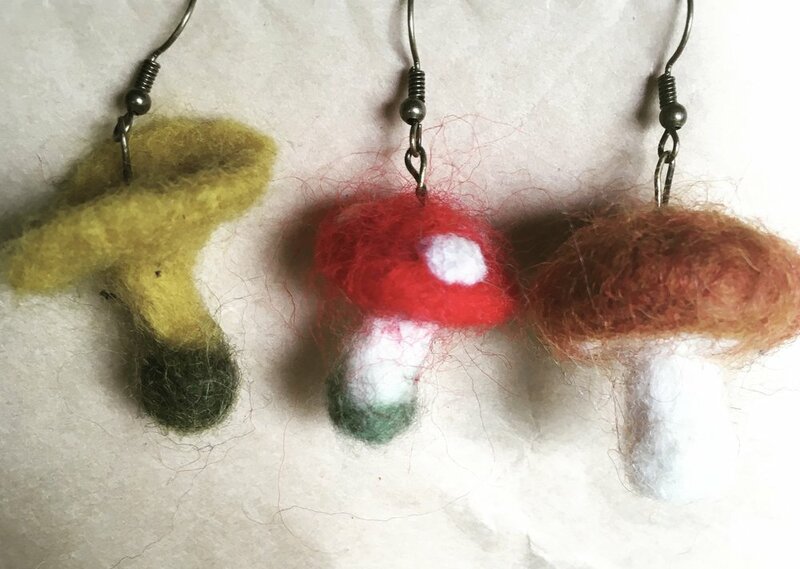 Needle Felted Mushroom Earrings of some of our favorite mushrooms. Light weight, and fun. Great way to inspire fellow mycophiles to strike up a conversation. Available year round at the Port Angeles Farmers Market or custom orders online if you contact me. Grow gourmet oyster mushrooms on your kitchen counter. We've done all the hard work, all you need to do is open up the bag, mist them and watch them fruit before your eyes. Also available in 1 gallon returnable pails as subscriptions so you can always have enough mushrooms to feed your family as well as a beautiful conversation piece on your kitchen counter. Contact us if you are interested or find our little kits in Port Angeles at Wild Spirit Herbals or Saturday at the farmers market. Available year round at the Port Angeles Farmers Market. Ditch the one time use plastic... yes there are fungi that can digest plastic but we still need to reduce using one time use items. These beeswax cotton wraps work terrifically, smell great, and I am still using ones I made two years ago. Available at the Port Angeles Farmers Market on online through our Facebook page. Starting soon, classes and get togethers. From forays, to cultivation, remediation, glow in the dark mushrooms, and more. Stay tuned for whats about to blow these spores to the moon.